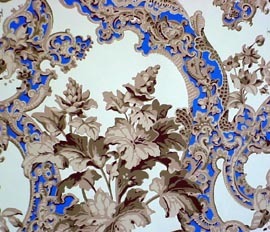 More about Burt Wall Papers where we make reproduction period wallpaper. Published under "WHO'S DOING WHAT?" in the July 1998 issue of WALLPAPER REPRODUCTION NEWS, Bruce Bradbury is quoted: "Burt is a true master of silkscreen printing technique. We've always admired his ability to create fine historic wallpaper reproductions." Published in "The Letterbox" of the March 2000 issue of VICTORIAN DECORATING AND LIFESTYLE, Ken Sarna, General Manager of Bradbury and Bradbury writes, "We recommend Burt Kallander for the most artistic reproduction work. Burt Kallander has worked for Bruce Bradbury and Bob Carter and deserves credit for many reproductions done during the last 12 years. 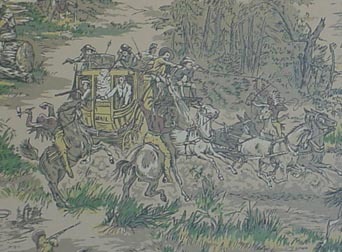 He has supplied the artwork, color separations and test prints for projects by both companies and the artwork provided by his historic wallpaper reproductions has far surpassed others doing the same work. Furthermore, his craftsmanship and integrity are highly commendable." The photo above appeared in the February 1988 issue of The Wall Paper, a trade magazine, in an article about Bradbury and Bradbury. Burt is shown reproducing the French block printed paper from the master bedroom of The Lincoln Home in Springfield, IL, a historic site maintained by National Park Service. Here is the "after" photo. The striking cobalt blue with white and muddy greys is not unusual in the mid 1800s. For other examples of Burt's work, check out the portfolio page. Experience: Burt left art school to work as a silk-screen artist for a sign company in 1981. In 1985 he was hired by Bradbury and Bradbury Art Wallpapers to mix colors and print. Bruce Bradbury introduced Burt to 18th century design principles and assigned him to manage the Art Department. There he created such patterns as "Algernon" and "Penelope Border," as well as adapting patterns, hand-cutting separations and developing new color schemes for Bradbury's collection. Burt's responsibilities also involved reproduction work for specific restoration projects. Leaving Bradbury's in 1990, he then returned after almost three years working for Mt. Diablo Handprints. The relatively small size of these companies enabled Burt to develop proficiency in many capacities. He struck out on his own in 1998 but continues to work closely with Bradbury and Bradbury on special projects. Some of the more than 34 public and private period homes that Burt reproduced wallpapers for, prior to working independently, include the interesting historic sites listed below. The list is grouped according to copyright/employer. Stonewall Jackson's Headquarters, Winchester-Frederick County Historical Society, Winchester, VA one paper, c.1850's. Wren's Nest, Joel Chandler Harris Association, Atlanta, GA, four papers, c.1890-1910. Patterson House, Ardenwood Farm, Fremont, CA, one paper, c.1914. Beyers-Evans House, Denver, CO, Colorado Historical Society, six papers, c.1890's. Beyers-Evans House, Denver, CO, five papers, c.1890's. Woodland Opera House, Woodland, CA, two friezes, c.1900. Richard Carr House, Canada, one paper, c.1860. Barnum Museum, Bridgeport, CT, wallpaper and frieze, c.1893. Eliel Barber House, Bloomington, IL, one paper c.1850's. Abraham Lincoln Home, Springfield, IL, two papers, c.1850's. William Howard Taft National Historic Site, Cincinnati, OH, two papers and one border, c.1860's. Billings Farm and Museum, Woodstock, VT, one paper, c.1892. Henry Ford Museum at Greenfield Village, Dearborn, MI, two papers, c.1850's. Ace of Clubs House, Texarkana Museums and Historical Society, Texarkana, TX, one paper, c.early 1900's. Pictured above. Buffalo Bill Museum, Cody, WY, one paper called "Wild West", depicting scenes from the famous Wild West Show, c.1890's. Museum exhibit pictured above. Fallon Hotel, Columbia State Park, CA, several papers and friezes from the late 1800's and turn of the century. Kearny Mansion Museum, Fresno, CA three papers, c.1900.